The kitchen is as useful as the gadgets in it. Where once we had the majority in cabinetry and a few drawers and everything had to be stacked and organised as neatly as possible, we now have endless accessories that make storing and finding stuff, a joy. One would think that the washing area is just that- a place to collect and wash up. Most of us stop at a tap, basin, a drain board and not much else. Like in everything else that we do, we urge you to think again. Inject a splash of personality; add a dash of sophistication and a pinch of much-needed convenience. Nothing elevates your style like adding washing accessories that perfectly blend beauty and functionality. From stainless grids to wooden chopping boards, utensils and strainers you’ll have the power to make prep-work more pleasing, clean up less complicated and entertaining an event reserved for courteously accepting compliments. With so many modern gadgets and little household appliances on the market, the kitchen suppliers have come up with clever ‘garages’ to store them out of sight, yet practically in a way that they can be accessed and used without moving them from their location. Throwing away refuse and caring for the environment go hand in hand. Bins are divided for easy recycling. Instead of 1 large bin for everything, we have now compartmentalised bins that fit neatly and out of sight into the kitchen cabinetry. The pull-out type makes it easy to take near prep areas or leave it open and wipe surface refuse directly into it. Washing bins out also becomes an easy task to be done in the kitchen sink rather than under a tap in the yard. For those who favour drawers to doors underneath the sink, you will find a very practical upper drawer tray that can house all the cleaning supplies and another deep drawer underneath that can fit various bins. Nowadays there are different sized ones and also colour coded for easy waste separation. Holding more than 1 cloth, this handy pull-out ensures you can stow away the rags out of sight when not in use. There are also pull-out detergent holders and little sponge containers for the ultimate in organisation. Corner cabinets are an inevitable challenge in most kitchen layouts. Sometimes there is no avoiding one. For the cases when the space is restricted and accessing inside cabinetry quite the task, we like to use pull-outs. These come in all sizes and types. There are chrome ones, revolving ones, kidney shaped ones, single or also double decker. Some are attached to the door, whereas some you need to reach in and pull-out yourself. Pull-outs are also handy for items like spices, oils and sauces and are thus available also for base & top cabinets plus tall columns. These mats provide a cushioned surface for storing items on. They are washable and prevent clanging of glasses, dinnerware and pots and pans. With our specialised broom cupboard, you can fit all the cleaning tools in one place. This cabinet has contoured inner shelving so that all the mop, broom and squeezer handles can fit easily plus there is also space for a regular household vacuum cleaner and all the detergents. If you are short on workspace, fret not. 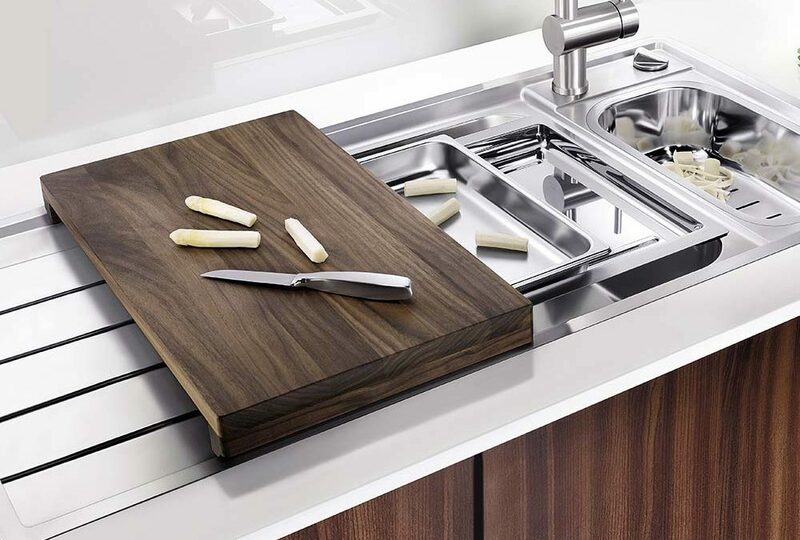 Nowadays most superior kitchen cabinetry suppliers have extractible worktops in materials such as wood or stainless steel. With one swift motion, you can easily extend your worktop from a base cabinet drawer or through a column. Lo and behold, your prep nightmares resolved. Cutlery trays come all in sizes and materials. There are wooden ones, stainless steel, plastic or a mix of 2 of these materials. Prices vary accordingly with the ones having more gadgetry and premium materials on the higher side. Organising drawers doesn’t stop at the cutlery tray. Today, we offer cutlery inserts matching the trays, film holders (foil, cling, baking paper etc..), pull-out knife trays, spice jars, kitchen scales, breadboard, cutting boards and also dish, bottle and plate holders. Prices vary accordingly. For those who don’t wish to clutter the surface next to the sink with a dish drainer, there are special stainless steel drainers mounted into the top cabinets above. In addition to the ones above, there is also on for a 45cm base cabinet. It pulls out neatly and is to be left open while the dishes are draining. These dish drainers have a plastic drip tray that is removable and washable and optionally illuminated via LED. Hanging rails are to be hung on the wall between the base and top cabinets- over the backsplash. Accessories like spice holders, kitchen towel holders, utensil holder and hooks can be fitted to these rails. The plinth is the detachable strip at the base of a kitchen- it hides the legs of the kitchen (which are in plastic in case of water spillage). While it can be removed easily to clean underneath or to access any pipework passing beneath cabinetry, not everyone knows that there are possible accessories that can be bought with it. One accessory is the vacuum fitting. A quick sweeping of the floor with a broom in its direction and this will eat away all the crumbs in one swift gulp. 2 additional accessories are the plinth heater- a fan that blows hot air to keep you warm and cosy while chopping away and also the plinth ladder- a small 2 step located in the plinth that can be quickly unfolded and used to access high cabinetry at the kick of a foot. Lighting options in the kitchen are vast. From LED strip lights that can be affixed with double-sided tape to plinths, to integrated strips in cabinet bottoms with touch sensor and variable intensity, to spot lights in various formats and emitting both warm & cool light, you are spoilt for choice. In addition to the mentioned, there are also remote controlled fittings plus sensors that enable the light to turn on automatically upon opening fronts (both doors & drawers). Such options are for inside of cabinets, underneath cabinetry and also for use with glass shelves.